After a long season it has all come down to this - Oregon vs. Auburn for the BCS National Championship. Each team has faced adversity and struggles in their quest to head home with the title. Click Read More for the video preview and share your thoughts on this game in the comments below. Oregon's up-tempo offense has done more than just "Win The Day," they have been a buzzsaw and helped the Ducks overcome slow starts in comeback victories against Arizona State, Washington State, USC and Stanford. The Cardinal led 21-3 in the first quarter before the Ducks soared to a 52-31 victory, while a missed Cal field goal helped the Ducks remain undefeated. 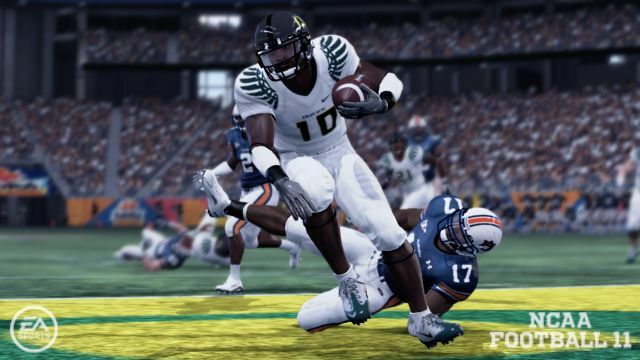 Running back LaMichael James leads the Oregon offense with 22 total touchdowns and nearly 1,700 yards of total offense. Auburn has had a flair for the dramatic as well with numerous comeback victories, highlighted by their 28-27 victory at Alabama in which the Tigers rallied from a 24-0 second quarter deficit. QB Cam Newton won the Heisman Trophy after an excellent season on the field (28 passing touchdowns, 20 rushing touchdowns) and overcoming speculation and rumors concerning his eligibility off the field. Which team will end their dream season with a National Championship? Far too low scoring, lol. I got to agree. The loser might have 31 by themselves, much less 31 points total in the game. I was tempted to use 10-minute quarters for realism. I don't think it will be quite as high scoring as some, though. I'm probably the only person, but I can see any outcome in this one - a close game or either team winning big. Each squad has had to rally from big deficits at some point this season and with the long layoff, they might be rusty enough to not put up many points and/or unable to rally if they fall behind big. Now, when it comes to picking a winner - I'd like to see Oregon win, but really have no inclination on which team actually will. This will be a shootout. I can't see either team scoring less than 21 points. I went with Auburn because the SEC is proven. I do hope it's a close game and I think Oregon will have to make significant plays in the passing game to win but that shouldn't be too hard with Auburn's pass defense. I think the score might be pretty close. There's a lot of times in big games where people talk about two high flying offenses that the defenses show up and shut it down. Got to go with Oregon cause I'm so tired of hearing how the SEC has won 5 in a row. Oregon's defensive team speed is going to really shock the Tigers. To me the difference will be whether Oregon can put some LONG drives together and keep their defense off the field all game, regardless of whether or not the Ducks are scoring. Auburn loves to wear teams down, and in the 2nd half they always pull away with big plays when the other defense is too tired to chase anymore. I want the Ducks to win, but think Auburn wins, Auburn will run the football milk the clock to keep the ducks off the field. cdj, you missed a [ in the original post, so the image doesn't show.